The U.S.S. New York earlier this month. NORFOLK, Va. — With a barely noticeable tug, the U.S.S. 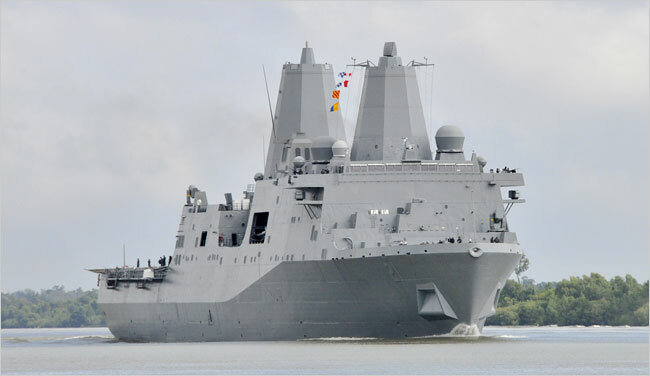 New York pulled out of its berth here Thursday morning, beginning a four-day journey to New York City, where it will be formally welcomed into the Navy fleet. etty Officer First Class Corey Lewis/United States Navy, via Getty ImageThe U.S.S. 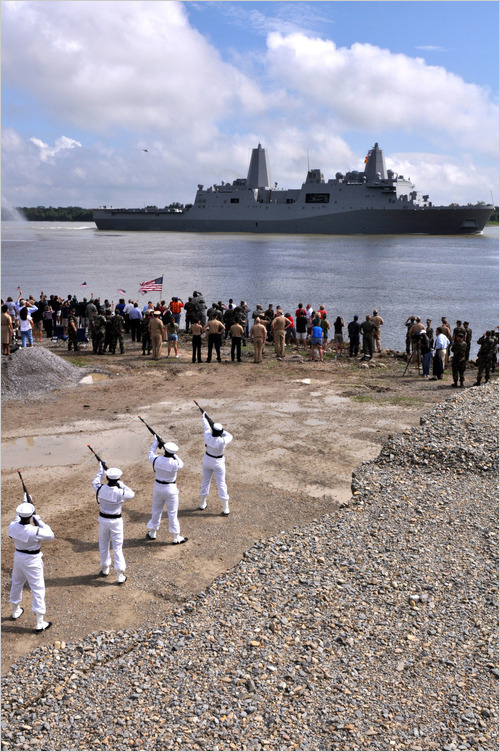 New York, whose bow includes steel recycled from the World Trade Center, began its journey to New York City. Delight in the display of Gingerbread houses that really are good enough to eat! The holiday creations come courtesy of students from the local area schools. Join Cornell Cooperative Extension of Ulster County (CCEUC) and the Ulster County Farm Bureau in an evening of celebration with fine food and top-notch entertainment for their annual dinner and silent auction. This year's honorees are Phillies Bridge Farm, Peggy Lapp, Chester Karwatowski, Lucky C Stables, Inc. and SUNY Ulster. $35 per person. Music by Rich Hines and the Hillbilly Drifters. Cash bar available. (845) 340-3990. Our favorite holiday—bringing together family, friends and feasting. If it's your first time hosting dinner and you're looking for help, check out HomeCookingNY Thanksgiving Tutorial. Or maybe this is the year to let someone else do all fuss, the cooking and cleaning. From country elegance to historic mansion, Hudson Valley restaurants set the stage for a perfect holiday meal—offering all the trimmings and the pleasure of service. A number of farmer's markets are still open and beets and colorful root vegetables take center stage. Savor the beauty and the sweet flavor of beets in this delicious salad from The Valley Table archives. 1. Place the red beets and the golden beets in separate pots and fill with water, salt and vinegar. Bring them to a simmer and cook until fork tender. 2. Let the beets cool and then peel. 3. Using a mandolin, shred the red beet with medium blade. Slice the golden beets on the mandolin as thin as possible. Optional: Add pieces of chicken or beef at this point if desired. 1. In a medium sauce pan, reduce the chicken stock to 1 cup. Transfer the stock to a stainless steel bowl. Note: Do not let the stock cool off; you will get better results if it's still hot. 2. Using a wire balloon whip, add the grated horseradish to the stock and slowly incorporate the grapeseed oil. 1. In a stainless steel bowl, mix the shredded red beets with the frisee, radicchio; add horseradish vinaigrette, to taste. Adjust seasoning with salt and pepper. 2. Place golden beets in a circle on a plate. 3. Place a portion of the red beet salad in the center of the golden beets. 4. Cut a 1-ounce piece of warmed goat cheese and place on top of the red beet salad. Dress with mache. 5. Drizzle the chive oil around the plate. All bottles with red tags will be reduced by 20% at the register. No further discounts will be given on these products beyond the 20%. Vino 100 will be relocating from the Newburgh Waterfront to 1278 Route 300 in the Town of Newburgh, on the corner of Routes 300 and 17K (In the Chili's/Panera Plaza). We anticipate being up and running by November 13th at the new location. Check out a little video clip of our last tasting at the Chill Wine Bar - It really was a great time. The cost for the event will be $20 per person. Advanced payment and reservations are required. Please call Vino 100 at 845-725-7680 to reserve your spot. Come to our Crafts on Stage Fair! Our Prompters have been hard at work acquiring over 100 American craft artists to show their hand-made goods this weekend. Come and see a large variety of items, from jewelry, ceramics, wood, leather, fiber, glass, baskets, fine arts and more. Leaf peeping is at its peak in the mid-Hudson Valley, with trees ablaze with reds, oranges and yellows. There's a new vantage point to view the fall foliage, the Walkway Over the Hudson, which is drawing thousands to view the change in colors in trees in Dutchess and Ulster counties along the Hudson River. At lunchtime Thursday, the pedestrian bridge was teeming with visitors. "It's breathtaking," Greta Becker of Poughkeepsie said as she and her husband, Donald Becker, took a walk on the bridge. "It's gorgeous, the view is great," said Chris Phillips of Loveland, Colo., who was visiting family in Poughkeepsie. Paul Gould, an artist from Orange County, was also up on the bridge, taking photographs of the scenery. "It's probably one of the best views, particularly coming from the Poughkeepsie side. With the Catskills in the background and the river - I don't think there's a more scenic vista anywhere along the Hudson," said Mary Kay Vrba, director of Dutchess County Tourism. Vrba said the Walkway has already boosted local tourism. "It's that 'one thing,' " she said. "Maybe they were already thinking about coming to Dutchess County and the Hudson Valley, and it persuaded them to come. "They're eating in our restaurants and doing additional hiking. ... Once they see how easy it is to get here, they're looking at where our farms and farmers markets are," she said. "Also, the opening of Franny Reese State Park enhances a person's time here," she said, referring to the 250-acre state park in the Town of Lloyd. The park officially opened Oct. 16 and connects to the pedestrian bridge via the Walkway Loop Trail. It features about three miles of hiking trails and several viewpoints. Fall colors should be at or near peak this weekend in many parts of the county. The northern part of Dutchess may be slightly past peak, while fall colors in the middle and southern parts of the county are expected to be at or very near peak, said Eric Scheffel, coordinator of the fall foliage program for I Love New York, the state's tourism agency. Mike and Dorothy Flynn, both of Hasbrouck Heights, N.J., walk across the span. Visiting the Walkway Over the Hudson in the City of Poughkeepsie is a great way to view the changing colors of fall. But anywhere in the county, you're going to get some good foliage viewing," he said. The weather may not cooperate, however. Meteorologists are calling for rain and a possible thunderstorm Saturday, with a high near 65, followed by sunny skies and a high around 60 Sunday, according to the National Weather Service in Albany. In his weekly foliage report, Scheffel wrote for Dutchess, "Look for up to 75 percent color change and brightening yellow and orange leaves and nice grace notes of red." Scheffel's report and a map charting the fall colors' progress can be found at iloveny.com. A recorded foliage "hot line," updated each Wednesday, can be reached by calling 1-800-CALL-NYS (1-800-225-5697). "They say sunny days and cool nights are good for bringing out the colors," Scheffel said. According to the United States Forest Service, "a succession of warm, sunny days and cool, crisp but not freezing nights seems to bring about the most spectacular color displays." "There's no doubt that fall colors are part of the attraction of getting out and being in an orchard," said Mark Doyle, business manager at Fishkill Farms in Hopewell Junction. Doyle said the rainy summer was not good for pumpkins, but apples did extremely well. He said he was "picked out" of pumpkins about two weeks ago, but the late-season apples are "coming up to full maturity and are very sweet now." Dave Fraleigh, owner of Rose Hill Farm in Red Hook, also carries pick-your-own apples and pumpkins. Fraleigh said he still has pumpkins, but the "yields weren't very good this year." Both Fraleigh and Doyle said the weather report has a big impact on business, even if it's wrong. A lot of customers come from the metropolitan area and may decide, based on the weather report, that they're not going to "drive two hours somewhere," Fraleigh said. "If it's wrong, they've already made their plans." But the view might just be worth the drive. "You can see the Catskill Mountains. It's a pretty nice spot," he said. Reach Emily Stewart at estewart@poughkeepsiejournal. com or 845-437-4882. Manhattanites with an uptown address can now take advantage of a free car service to several Harlem restaurants. Thanks to the new "Get Paid to Play" initiative, the owners of Viaduct Valley (ViVa) eateries Hudson River Cafe, Pancho Gringo and Covo have banned together to battle recession dining by offering free transportation to and from their respective restaurants. The car service applies to diners coming from Spanish Harlem, Morningside Heights, Harlem, Hamilton Heights, Washington Heights, the Upper West Side, Fort George and Inwood. For all other diners, the ViVa owners will chip in $10 for gas and tolls. A skirt steak and yuca fries from Hudson River Cafe. that could work as a kind of "laboratory"type space. vampire story in the style of "The Grapes of Wrath." should feel out-of-place in modern setting. Nov 23. They need car for 2 days in that period. This Saturday, October 31 at 10am the Hudson Highlands Nature Museum will take you into the world of spiders with Spook-Tacular Spiders! Come to the Outdoor Discovery Center location, entrance on Muser Drive across from 174 Angola Road, Cornwall, to learn about the remarkable life of spiders that are found on every continent of the world and have existed for millions of years. Participants will meet a few of these impressively large arachnids, which are anything BUT creepy! The morning will end with an artful craft to take home. This program is suggested for adults with or without children and children ages 5 and up. Cost: $5. Members are $3. For more information call 845-534-5506, ext. 204. On Saturday and Sunday, October 31 and November 1 at 2:30pm come to the Wildlife Education Center, 25 Boulevard, Cornwall-on-Hudson, for Meet the Animals! This special Meet the Animals will feature the Crow and the Raven! Visitors to the Wildlife Education Center will also enjoy the "new exhibit" - The Sturgeon Swims through Time - a view of 400 years of fascinating Hudson River history through the "eyes" of an Atlantic Sturgeon. The exhibit includes interactive elements which will engage all vistitors as well as a 77" Sturgeon relica. Eileen McAdam, Director of The Sound and Story Project of the Hudson Valley, will be the featured speaker for the Annual Meeting of the Friends of Senate House on Wednesday November 4th, at the Senate House Museum, 312 Fair Street in Kingston. Ms. McAdam has made it her mission to preserve and celebrate the history and culture of the Hudson Valley through recorded sound. Her Sound and Story Project includes oral history interviews but it also encompasses many unusual sound recordings that portray this region, including the now-silenced bells of early American churches, or the sounds of bats in the caves of Rosendale. McAdam will talk about the art and method of capturing and preserving sounds, and the history they offer us. The program will begin with light refreshments in the Musuem's Vanderlyn Gallery at 6:30 PM, followed by a brief annual report, with the keynote address starting at 7:15 PM in the second floor gallery. The program is free and open to the public. Nightmare on Elm Street? Not Really. It's Just Halloween on Some Streets in Suburbia. T wasn't until after Matthew and Biliana Ally had closed on their 160-year-old house on Parrott Street in 2004 that the previous owner, a sculptor, mentioned the street's real claim to fame. "You really have to come here for Halloween," he said. "You're not going to believe it." When they and their twin daughters, now 12, went there last year - before they even moved in - they found more than a thousand costumed children descending on a single village block with piped-in fright sounds and enough ghouls, crypts, monsters, spiders, mummies, graveyards and the rest to populate any slasher movie yet filmed. Their own house, it turned out, was famous for the previous owners' two-story dragon with smoke coming out of its nostrils, propped up on a basketball backboard. And so, the Allys, like countless other unsuspecting homeowners, found themselves in that relatively obscure, one-day-a-year subset of suburban demography - the Central Candy District - the part of town where kids alight en masse in search of candy, safety, candy, entertainment and candy. No one on Parrott Street, with its 19th-century Victorians dating to the days of the old foundry here, agrees on just when kids from all over town and nearby ones like Garrison and Beacon began showing up, lured by reports of over-the-top Halloween décor. Vic Schwarz, who has been there 45 years, thinks maybe 10. Ann Bouchard, who has been there for 30, says it is more like 18. But whatever the case, the logic is the same. With new housing sprawling across the Hudson Valley, parents and children want a neighborhood where you can actually walk around, rather than hiking from two-acre lot to two-acre lot. No one can claim McMansion neighborhoods were designed for trick-or-treating. And with safety an issue for parents in a way it was not for their own parents, having one street, section of town, condo project or whatever become Halloween Central has a definite comfort-zone appeal. So Parrott Street has become the kind of place where prospective homebuyers should probably be forewarned with something akin to radon warnings alerting them to the substantial responsibilities and cash outlays expected every Oct. 31. WITH scaring the neighbors no longer enough for most self-respecting trick-or-treaters, almost every area has a favored trick-or-treat zone. At the intermediate level are places with homes on small lots with walkable streets, like the Pines in Roslyn on Long Island, where neighbors can expect 100 kids or so. In Hastings, in Westchester, everyone goes to Euclid Avenue, a patch of flat land in a hilly town. In Briarcliff, they go to the wide boulevard of Tuttle Road. At the top of the density scales are suburban downtowns like Main Street in Newtown, Conn., where Harvey Pessin and his family prepared 2,000 treat bags for visitors two years ago and still ran out by 9 p.m.
Not everyone will put on a Texas Chainsaw Massacre display, like one Parrott Street resident did, but almost everyone does something. So, for their first Halloween on Parrott Street last year, Elizabeth Broad and Mary Yelenick came up with a flaming skull poking out of an attic window, ghosts hanging from the dogwoods and other seasonal touches, and greeted their little guests in witch outfits. They figure they will spend $130 on candy this year. To help defray costs, the local grocery store takes candy donations that are delivered to the Parrott Street folks, some parents of trick-or-treaters bring candy donations as well, and residents end up buying in bulk at Sam's Club or Costco. And they are parsimonious with the Tootsie Roll pops and miniature Snickers bars, lest they run out by 8. In truth, Halloween can be a little bittersweet. It, perhaps more than any other holiday, revolves around the real dividing line of suburban life - how old your kids are. When they are little, Oct. 31 every year is just about the most important day in the history of the world. When they are grown, you wonder how much energy you want to put into hastening the tooth decay of all those tiny strangers in mustaches, tutus and Darth Vader masks. You can, of course, turn off the lights and go out to dinner. Some do. But for most, living in the Central Candy District does have its responsibilities. Mr. Schwarz, who is retired and repairs guitars and mandolins, was out on his front porch with his banjo last year and figures he might round up some friends to play on Monday night. Still, he figures the festivities have become quite big enough. So when contemplating the prospect of a newspaper story that might alert still more people to Halloween on Parrott Street he had a succinct bit of advice. "Don't you dare," he said.